spooky. Perfect as we head into the final days before Halloween. I used a few die cuts leftover from the Halloween kit that Jeanne sent me. I am also entering this card at Simon Says Wednesday Halloween Inspiration. Now it's your turn. How does SPOOKY inspire you? I hope you play along this week. Please remember to keep it Clean and Simple. Our Guest Designer is Isabelle. Fantastic ! That's a CAS card ! Your die cuts are terrific (I hate spiders !). Thanks for sharing and for your sweet comment on my blog. 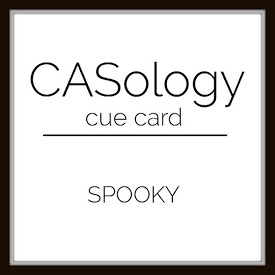 It's a great pleasure to play along with CASology ! Spiders give me the creeps, but your spider looks great on the web, which works perfectly with the tag! Awesome CAS card ~ Love your take on the Cue Card, Joyce! Most definitely a treat, Joyce! Fabulous CAS design card, although I'm a bit worried that the spider looks a bit too life like. A fab card, and a lovely cluster of diecuts (that spider is creepy! LOL). Fabulous! The web tag is perfect for your scary spider! I don't mind them at all but know many people do. Looks like that card kit came in handy for a number of challenges, Joyce. Those happy pumpkins are unaware that the spooky spider is closing in. Joyce, that is a really cool die cut spider web...I've never seen that before. Awesome spider, too...a cool Halloween card all around! Hey Joyce!! I love your spider. He looks scary. That tag with the web. Super creative. A fantastic Spooky design Joyce. That white web tag really pops off the white background! !